Herman Cain sexual harassment press conference: His falsifiable statements will destroy him. Herman Cain’s press conference about his sexual harassment accusers is a road map to his destruction. 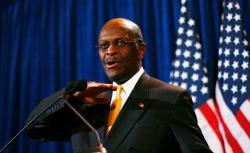 Herman Cain’s sexual harassment press conference: Deny, deny, deny. Herman Cain is going down in flames because he failed to learn the first rule of political scandal: Don’t make statements that can be falsified. You can lie about what you believe. You can lie about what you’d do if elected. You can deny that your tax reform plan would raise taxes. You can get away with all of these things because they’re matters of speculation, interpretation, or argument. But if you make specific factual claims about the past, as Cain did in his Tuesday press conference about sexual harassment allegations, you can be flatly disproved. Worse, you can goad your accusers into backing up their charges with evidence. That’s what Cain has done. His press conference is a road map to his destruction. The press conference began with Cain’s attorney, Lin Wood, claiming that accuser Sharon Bialek had mysteriously chosen “to tell her story to a third person for the first time” after “14 years, when recollections have faded [and] witnesses cannot be located.” Really? Bialek has affidavits from two people to whom she reported the incident when it happened. That’s odd, because Bialek says that when she arrived in Washington to meet with Cain in mid-July 1997, she found that her reservation at the Capitol Hilton had been converted to a “palatial suite.” She says that Cain told her, “I upgraded you.” Would Bialek recognize the room today? Does the hotel keep records of who paid for which room? If so, the source of payment for that room on that night can be checked. The same might be true of Bialek’s reported dinner with Cain at an Italian restaurant that evening. Can she identify the restaurant? Does the restaurant keep payment records going that far back? Cain had better hope not. Nope. Kraushaar tells CNN that the incident Cain described was “so innocuous it wasn’t even a part of my complaint.” She says the truly inappropriate incident, reported in the complaint, occurred in her office, not Cain’s. Thanks to his denials, we’re certain to hear and read more about it. In an Oct. 31 appearance at the National Press Club, Cain said he was unaware of any settlement of harassment allegations against him. Then he acknowledged that he had been told of an agreement. But two days later, he continued to insist that in his 40-year business career, “that was the only instance of accused sexual abuse—sexual harassment, the only one.” Now we know that at least two such accusations were settled for a combined $80,000, far more than Cain suggested. And a former employee of the United States Agency for International Development tells the Washington Examiner that three years after Cain left the NRA, he tried to get dinner dates with two women after a speech overseas. The stories just keep coming. At his press conference, Cain said the allegations against him were uncorroborated. But former NRA pollster Chris Wilson has told an Oklahoma radio station, “I was around a couple of times when this happened.” Wilson referred to an incident “at a restaurant in Crystal City” in northern Virginia. According to Wilson, “many people were aware of what took place” there. For all of this, Cain has gone unpunished. His rise in the polls has given him the illusion that he can go on making false and falsifiable statements, even when the question is sexual harassment. He’s about to find out the hard way that he can’t.